In yesterday’s analysis of the latest Oscar de la Renta show one considered the importance of remixing things in a progressive manner. What comes before undoubtedly informs the present. Artist Giotto di Condone improved upon the two-dimensional Byzantine art style in the 14th century, Renaissance artists took that one step further with the discovery of anatomical knowledge; the intellectualised parlance of Anton Chekhov was reworked in a more down-to-earth, humanistic but bitingly witty fashion by Irish playwright Sean O’Casey; the “adrenalised insurgency” of Detroit bands inspired punk rock band Kraftwerk which led to the development of OMD’s electronica and, in turn, Depeche Mode’s synth pop of the 1980s. Equally, a fashion designer like Elsa Schiaparelli continually informs the contemporary output of Miuccia Prada, or Alessandro Michele at Gucci. 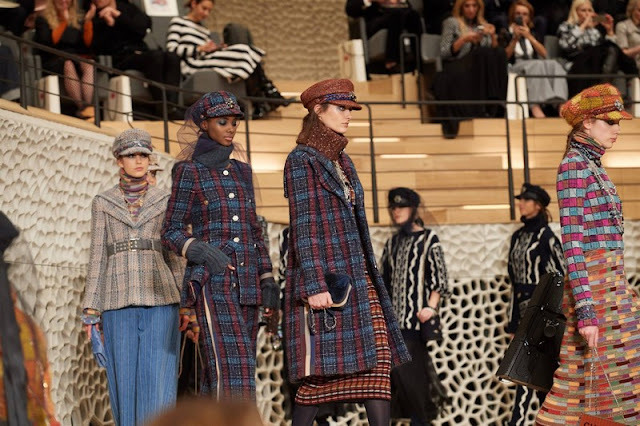 Karl Lagerfeld at Chanel has mastered the art of remixing, suffusing his own aesthetic indelibly into the soul of the brand. The common misconception with a Chanel collection is to presume it is all manufactured with her in mind. This is not the case. In thirty-five years, Mr. Lagerfeld has amassed the accreditation to supplant much of the old fashioned, replaceable fodder of the original Chanel with more modern iterations that have unmistakably engrained themselves in the house’s framework. The annual Metiers d’Art presentation—shown in December, and in locations ranging from a barnyard set in Dallas, Texas to a castle in Linlithgow, Scotland—arrived at the Herzog & de Meuren-designed Elbphilharmonie in Hamburg, Germany on December 6. The function of the Metiers d’Art show is to transport the audience to a new location, one which Gabrielle ‘Coco’ Chanel had a connection to. This season it was loosely referencing her heritage—a shipping port well-supplied with sailors and fishermen, Chanel borrowed inspiration from their uniform in her womenswear collections. However, linking back to the idea of Mr. Lagerfeld’s signature permeating the house, this season was very much about him. The creative director was born in the city and his memories of it in the 1960s were strongly redolent in a mostly monochromatic palette. 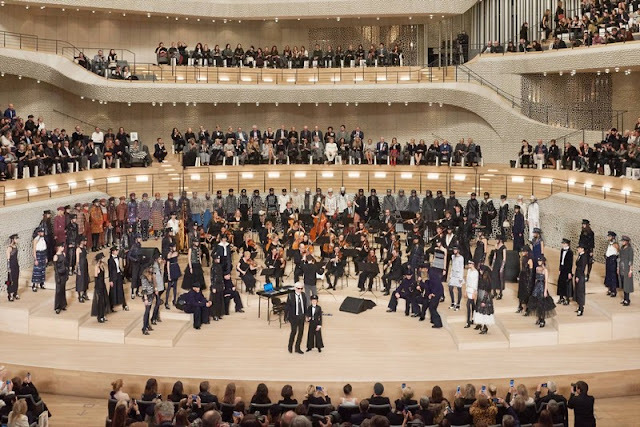 There were the distinct, swishy trousers of the sailors, seen on both men (who carried pipes) and women; the abbreviated hemlines and quirky patterns of the epoch catching ones eye as the models concentrically travelled from the top of the Elbphilharmonie to the orchestra pit on the bottom floor. There weren’t many curveballs—besides some of those buttery leather coats—but the addition of the Maison Michel sailor caps added a heightened degree of joviality, symbolic of Mr. Lagerfeld’s playful streak. Chanel is a prime example of unethical excess—with eighty looks in every collection, six collections a year, hundreds of commercial points around the globe, extravagantly high air miles amassed from flying its guests in from far-flung destinations—dominating fashion today. However, it is an irreplaceable luxury brand, captained by Mr. Lagerfeld and it serves a function required by thousands of women, and is an aspiration for millions. It may be frustratingly repetitive at times but Mr. Lagerfeld is a practitioner of the fine art of subtly shifting things with the aid of the winsome styling of Lady Amanda Harlech. Every now and then it strikes gold with its confident styling. The lustrous surface decoration of this one glistened from the get-go—absorbed by the clothing, everything else begins to blur, like our fond, faded childhood memories.